The first boats were made very early indeed in the Neolithic stage of culture by riverside and lakeside peoples. They were no more than trees and floating wood, used to assist the imperfect natural swimming powers of men. Then came the hollowing out of the trees, and then, with the development of tools and a primitive carpentry, the building of boats. Men in Egypt and Mesopotamia also developed a primitive type of basketwork boat, caulked with bitumen. Such was the “ark of bulrushes” in which Moses was hidden by his mother. A kindred sort of vessel grew up by the use of skins and hides expanded upon a wicker framework. To this day cow-hide wicker boats (coracles) are used upon the west coast of Ireland where there is plenty of cattle and a poverty of big trees. They are also still used on the Euphrates, and on the Towy in South Wales. Inflated skins may have preceded the coracle, and are still used on the Euphrates and upper Ganges. In the valleys of the great rivers, boats must early have become an important means of communication; and it seems natural to suppose that it was from the mouths of the great rivers that man, already in a reasonably seaworthy vessel, first ventured out upon what must have seemed to him then the trackless and homeless sea. No doubt he ventured at first as a fisherman, having learnt the elements of seacraft in creeks and lagoons. Men may have navigated boats upon the Levantine lake before the refilling of the Mediterranean by the Atlantic waters. The canoe was an integral part of the heliolithic culture; it drifted with the culture upon the warm waters of the earth from the Mediterranean to (at last) America. There were not only canoes, but Sumerian boats and ships upon the Euphrates and Tigris, when these rivers in 7,000 B.C. fell by separate mouths into the Persian Gulf. The Sumerian city of Eridu, which stood at the head of the Persian Gulf (from which it is now separated by a hundred and thirty miles of alluvium ), had ships upon the sea then. We also find evidence of a fully developed sea life six thousand years ago at the eastern end of the Mediterranean, and possibly at that time there were already canoes on the seas among the islands of the nearer East Indies. There are predynastic Neolithic Egyptian representations of Nile ships of a fair size, capable of carrying elephants. Figure 157: Boats on the Nile, 2500 B.C. Very soon the seafaring men must have realized the peculiar freedom and opportunities the ship gave them. They could get away to islands; no chief nor king could pursue a boat or ship with any certainty; every captain was a king. The seamen would find it easy to make nests upon islands and in strong positions on the mainland. There they could harbour, there they could carry on a certain agriculture and fishery; but their specialty and their main business was, of course, the expedition across the sea. That was not usually a trading expedition; it was much more frequently a piratical raid. From what we know of mankind, we are bound to conclude that the first sailors plundered when they could, and traded when they had to. The Aryan peoples came late to the sea. The earliest ships on the sea were either Sumerian or Hamitic; the Semitic peoples followed close upon these pioneers. Along the eastern end of the Mediterranean, the Phoenicians, a Semitic people, set up a string of independent harbour towns of which Acre, Tyre, and Sidon were the chief; and later they pushed their voyages westward and founded Carthage and Utica in North Africa. Possibly Phoenician keels were already in the Mediterranean by 2,000 B.C. Both Tyre and Sidon were originally on islands, and so easily defensible against a land raid. But before we go on to the marine exploits of this great sea-going race, we must note a very remarkable and curious nest of early sea people whose remains have been discovered in Crete. 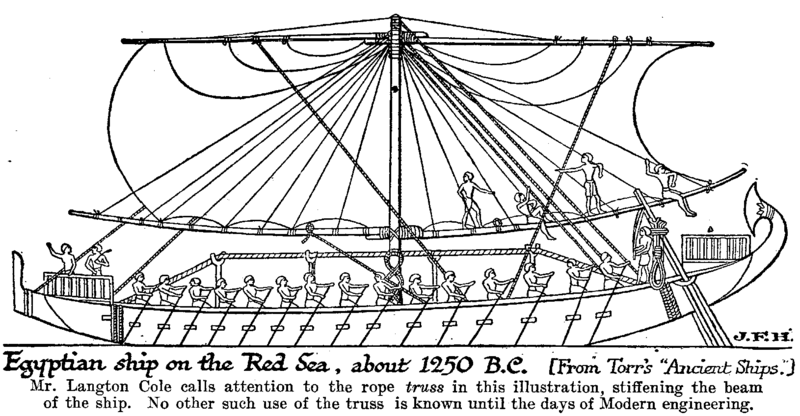 Figure 158: Egyptian Ship on Red Sea, 1250 B.C. Mr. Langton Cole calls attention to the rope truss in this illustration, stiffening the beam of the ship. No other such use of the truss is known until the days of modern engineering. Mosso, The Dawn of Mediterranean Civilization. —R. L. C.
 Cecil Torr, Ancient Ships .